Have you ever noticed that as you grow older, the amount of time you take to celebrate your birthday gets longer? No? Just me? When I was younger, there was so much anticipation that built up to my birthday. There was the "family birthday dinner" with the birthday person deciding on the meal, and family presents exchanged. And then there was the Big.Birthday.Party with all my friends invited. Just those two days, and that was it. (Two days because I am the child with the odd-day not-typically-on-a-weekend birthday, and we all know Saturdays are the best for parties, right?) See, as I grow older, my birthday celebration actually gets longer. We had cake and opened presents at my sister's on Saturday, I had my actual birthday on Monday with presents from the hubby, presents randomly showed up on my doorstep yesterday, and we are going out for a belated birthday dinner tonight. Don't get me wrong, I actually kind of like it this way. More celebrating and reasons to eat cupcakes! Hold on. Now just wait a minute. Didn't I just make some Dark Chocolate Peanut Butter Cupcakes not too long ago? Why yes, I did. But here I am, being sneaky and switching it up on you. Instead of a chocolate cupcake with peanut butter frosting, I opted for a peanut butter cupcake with dark chocolate frosting instead. 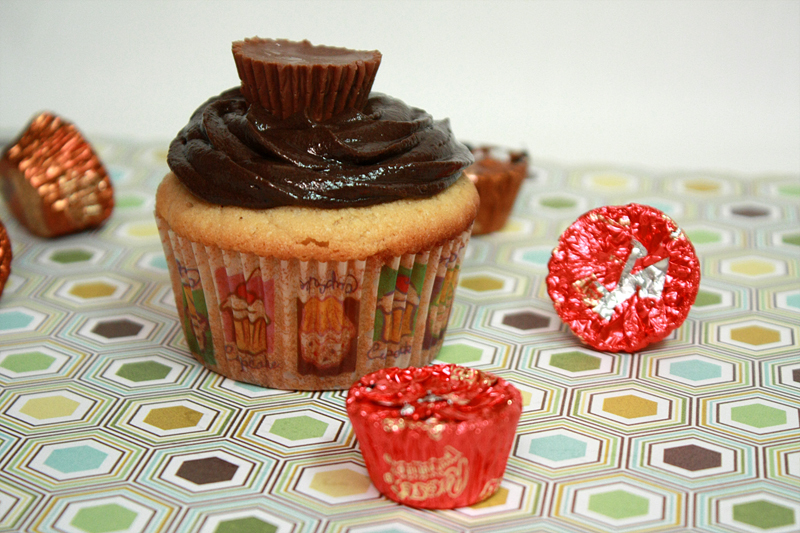 Surprisingly, peanut butter cupcakes are not a popular as one would think (especially after eating one). With chocolate cupcakes, it just takes a simple search or two to be completely overwhelmed by all the different variations. With peanut butter cupcakes, you have, oh, about 8 choices. Makes for an easy decision. And good ol' Martha Stewart came through, as always. Preheat oven to 350 degrees F. Line two muffin pans with 18 cupcake liners. In the work bowl of a mixer, combine 1 1/2 sticks (3/4 cup) butter and granulated sugar. Mix together until light and fluffy. Add in the peanut butter, and mix until smooth. Add in eggs, one at a time, mixing until each is fully incorporated before adding the next egg. Add 1/2 of the flour mixture to the wet ingredients. Mix until fully incorporated. Mix in the sour cream and 1/2 teaspoon vanilla until well combined. Add in remaining flour mixture, mix until fully incorporated and batter is smooth. Bake at 350 degrees for 18-22 minutes, or until a toothpick inserted in the middle come out clean. Allow cupcakes to cool in pan for 10 minutes, then remove to a wire rack and let cool completely. In a large bowl, beat the butter on medium-high until smooth and creamy. Add in 1 teaspoon vanilla, and mix well. Slowly add in the powdered sugar, beating until smooth. Add in 3 tablespoons of cocoa, mix until well incorporated. Mix in 2 tablespoons of milk. Add remaining 3 tablespoons of cocoa, followed by the remaining 2 tablespoons of milk. Mix until frosting is smooth and fluffy. 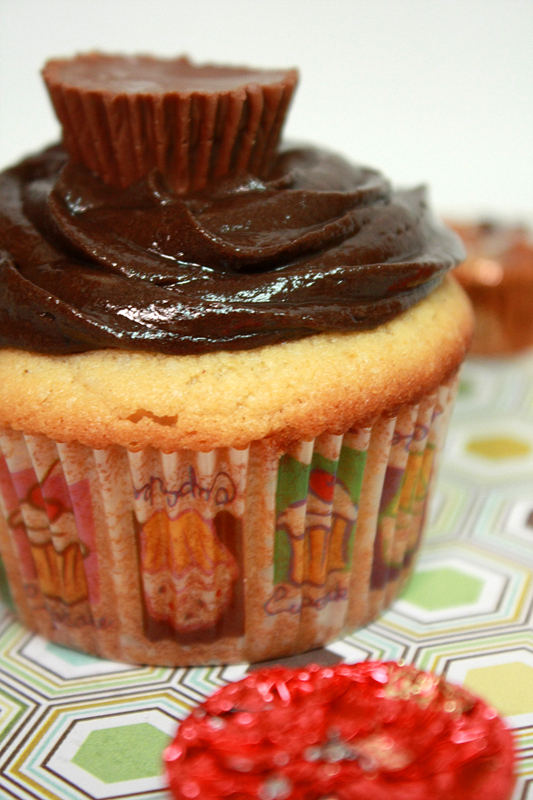 Decorate cupcakes once they are fully cooled. I was a little leary going into this project -- I was assuming that the peanut butter was either not going to be very prominent, or it was going to make these cupcakes very dense. And I am happy to report that it did neither of those two things. The cupcakes were light and fluffy, just as they should be. Of all the cupcakes I have made before, I am in absolute shock that I have yet to try a chocolate buttercream. Seriously, no chocolate frosting? Nope, only ganache. I didn't want to go with ganache on these as it can get heavy and super sweet, fast. Instead I simply modified my typical buttercream recipe by adding in cocoa and milk (the cocoa stiffens up the buttercream, and the milk helps to loosen it back up). And I think it worked out just fine. Don't be scare by the high quantity of cocoa added in, you really do need that much (or more) if you are going for a nice deep chocolate flavor. Nom.nom.nom. I think my birthday should come around more often. They look so perfect, thanks for sharing. I wish you hadn't left the calorie information. They were delicious. Still though I have to rate the strawberry-lemon basil cupcakes number one. You should probably keep trying to top them though. Those look so yummy! They kind of remind me of peanut blossom cookies. I wonder how the would be with a banana pudding filling? You sure are lucky to have so many people celebrating your birthday for u! 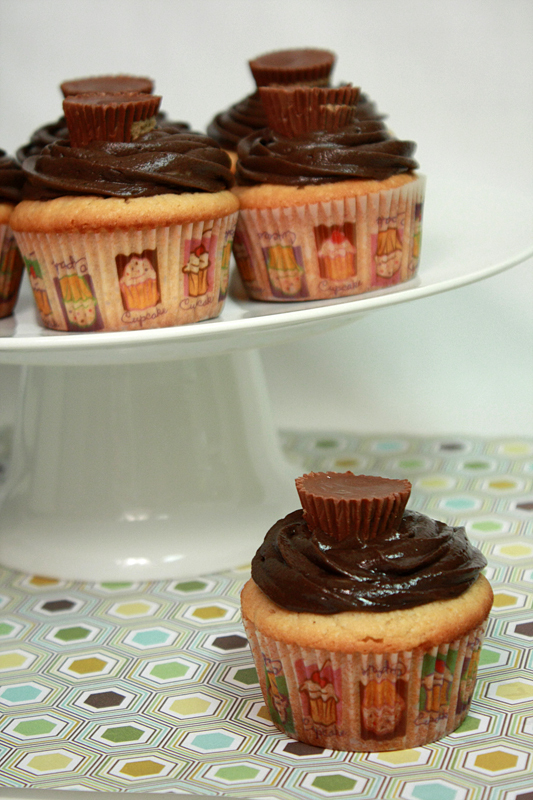 Peanut butter and chocolate are a magical combination no matter who gets to be cupcake, who gets to be frosting! YUMM!